After passing the border we drive about 400km straight across something what looks like a half-desert. From time to time we pass a small village, with a few poorish-looking houses. All life seems to take place in Baku at least from what we have seen. As we arrive in Baku, the desert disappears and we are greeted by Little Dubai. We drive past large villas on the coast; international corporations have their HQ in shiny skyscrapers. People drive big SUVs and wear a lot of gold. The capitol city is a city of contrasts: Old Persian style architecture mixes with soviet era buildings. In-between are beautiful art nouveau townhouses, which remind us of Paris. Sandstone vs. concrete steel, hammams vs. skyscrapers, small shadowy alleys vs. eight lane highways – Baku has it all. During our stay the city officials were preparing for the Formula One race. Preparations included shutting down half of the city’s traffic and laying out an extra three layers of asphalt, which will be removed afterwards. 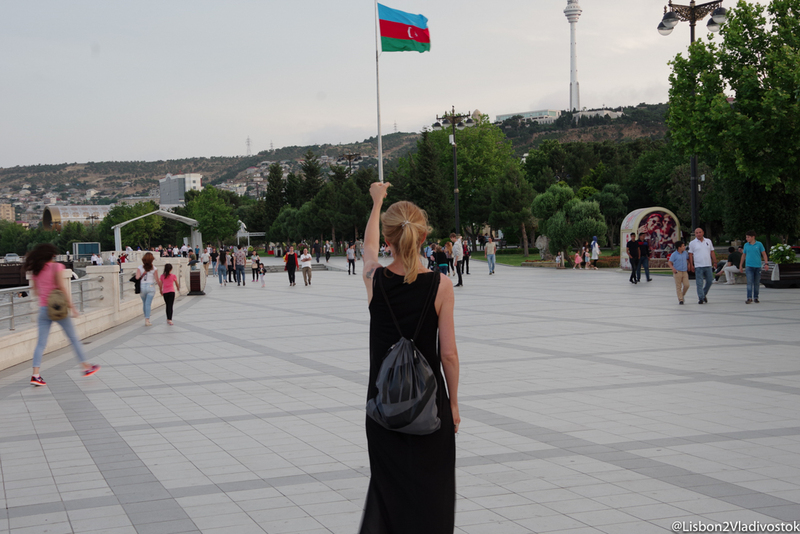 Of course we go on one of our beloved Free Walking Tours where we learn that high-class society in Azerbaijan speaks exclusively Russian, it is considered as chic. Who does not speak any Russian has a hard time joining the high class. The majority of the population is Muslim, but the practice of Islam is not as strict as in Turkey. Although it is Ramadan people are living a normal life on the streets of Baku, eating out, shopping, relaxing. Alcohol is served and allowed everywhere and you can see regular European summer street wear from all famous fashion brands. It seems that much of the Muslim traditions have vanished as Russians were in charge here. Oil is the number one business and we ask ourselves one again what people think will happen when it is gone. It is a vital question, but the people are not questioning this at all although the big boom era seems to have passed. As we look behind some of the parade buildings and streets we see that many are not finished due to a lack of money. There are a lot of abandoned constructions sites all over the city and only a few floors are lit in evening in the symbolic flame towers, which once stood for the new and rich Baku. Our guide Ganni is about mid-twenty and tells us that many of his friends would like to see a fresh start. They want to launch start-ups, invest in new business areas and be independent of Oil and Gas. They do not want to speak Russian hence are not welcomed by the high-society the rulers of the country. Consequently they would like to see the country move in a different direction, they want to live a self-determined life, be free and travel around the world. For now it is only a vision, but one that unites the young population of the country. Thank you Ganni for this wonderful tour, we wish you and your friends all the best! For three days we deep dive in this fascinating, eclectic city which offers so much to explore. On the outside Baku is a European capital but on the inside it is still far away from the Europe we know. Since we did not get a Visa for Turkmenistan we change our plans and set off to Kazakhstan with the Caspian Ferry. From there we plan on travelling straight to the Uzbek border. There is no possibility to get a transit visa for Turkmenistan in Baku or Tbilisi. The best way is to apply for a Turkmen visa somewhere in Europe (UK, Germany, Austria, France seem to work quite good) and then collect it in Georgia or Azerbaijan. We should have applied in Berlin, but did not exactly know when we would enter the country. It is quite impossible to get a transit visa upon arrival, so we needed to change our plans. Trying to catch a ferry over the Caspian Sea can be quite challenging. We spent three days trying to get a ticket. The best way is just to drive to the ferry terminal in Alat (around 70km from Baku) and then stay there until the ferry comes. We made the mistake of going back to Baku and when we came back the next day the ferry was already gone without us. It is possible to camp in the harbor together with the truck drivers. They have a small café there and toilets (terrible ones, but there are ones) as well. It is the safest way not to miss the ferry. Once you bought the ticket and have given your documents to the border police you cannot leave the harbor with the car. It has to stay there. As we had a 30-day visa for the car as well we were not in a rush, but we heard about people getting only a 72 hour transit visa for older cars. In this case you can leave the car in the port as it is considered “customs cleared” there and eventually go back to the city by taxi. The ferry costs 460 USD in total for the car and us. We took the 80 USD tickets per Person for a private cabin. Mixed cabins are a bit cheaper. After a 24-hour ride which was calm we arrived in Aktau in Kazakhstan. It is a quite complex process to clear the car at the customs (you have to fill out several documents and get them stamped at several places). We also had to pay around 25 USD import fee and around 50 USD for a 30-day car insurance. You can try to talk to the border police and ask them politely to speed up the whole procedure. They are usually quite friendly to tourists. They understand only Russian however. We spend only one night in Kazakhstan before going to the Uzbek border. We will return to Kazakhstan after that. Are you planning to do the Mongol Rally? Or maybe a similar trip by yourself? To help jump-start your big adventure, we've put together all our research results, tips, hints and general useful information in one ebook.